Coastal Living Builders is based in the Hilton Head Island and Bluffton area. Founded and operated by owner Simon Cooke. Coastal Living Builders specializes in quality custom homes and renovations to fit each client’s lifestyle and budget. We pride ourselves in building a relationship of trust through consistent communication with the client from concept to completion. We hand pick only the best and proven sub contractors who are carefully managed to time and agreed budget. Our costs and prices will be transparent throughout the process as we aim to deliver the finest quality results for your home. We have immense pride in our work and look forward to working with you. Our core values are our guiding principles. Communication: If you’re like many of our customers, and based out of town while your new home is being built, rest assured you are in good hands with Coastal Living Builders. We believe in giving our clients peace of mind throughout the building process. On Time: We have a commitment to your time line and the creation of a practical concept plan that helps our clients fulfill their dreams in a timely manner. Honesty: We believe in maintaining total honesty at all times and the highest level of business ethics. Competitive pricing does NOT mean we lower our quality standards. Competitive pricing is achieved through competent project management while maintaining high quality standards. Simon Cooke grew up in England, attended The Collegiate School in Richmond Va as a teenager and graduated from The University of Virginia. While at UVA he played on the golf team and earned 3-time All-America honors as well ACC Player-of-the-year in 1996. He attained golf’s highest levels with experience on the PGA Tour before discovering his passion for real estate, renovation and building in 2005. He has lived in the Lowcountry and specifically on Hilton Head Island for the past 20 years and has come to know and love its delightful history, customs and lifestyle. 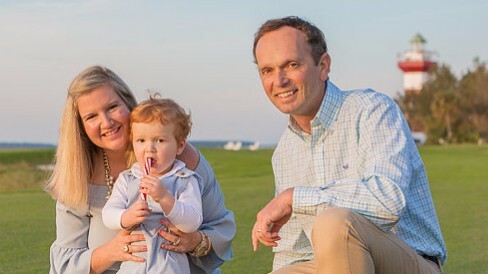 His wife Margaret is a native to Hilton Head, grew up in Sea Pines and teaches elementary school in the community. Between them they understand and appreciate what Lowcountry living means.